Awesome as usual Marisol! I know everyone loves these post it note holders, and the girls will love the big paper clips, thanks for sharing these great projects. Bien Amiga!! Thanks for the great inspiration. what great gift ideas. Love both your projects. Thanks for sharing. Your post it note holders are fantastic. What a great gift idea! I love the giant paperclips! Wish I would have known about these and stamping when my daughter was in Girl Scouts. How fun, love the bookmarks. So cute Marisol! I'm a teacher and I know I'd love to get one of these as a gift (the jumbo paper clip would be awesome too)! Great idea for me to use for teaching partners! Thanks for sharing! 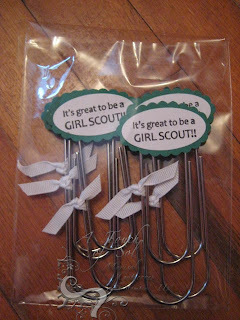 Cute, cute, cute ... love the paperclip idea and cute to make for the scouts. And I can never have too many post it note holders around! Hola' Marisol, What a fun and creative idea you have there. I have one of these in my stash , guess I'm going to have to decorate it lolol! You 'rocked' with these projects! So pretty, Marisol, love the colors on these. And what a sweet Girl Scout idea! I like the orientation of the acrylic frame and what girl scout wouldn't want a paper clip like this? Nicely done. Another great craft fair idea. Great projects!! 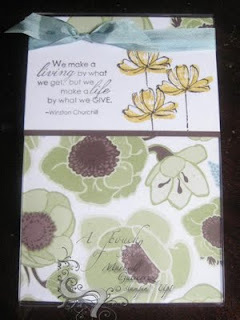 I love the girl scout bookmarks! Pretty, pretty, pretty! thanks for showing your project with two different dsp patterns--that really drives home how many looks a project can have just from the choice of paper. . . Nice work, Marisol! 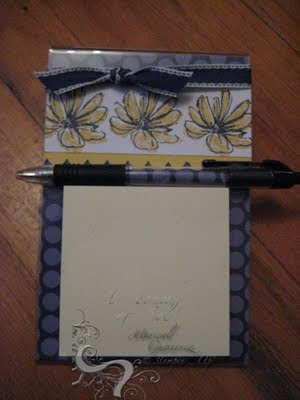 Love the Post It note project and your GS girls are going to love the paperclips! TFS! Love your projects! Thank you for sharing your beautiful works of art!